Imagine this scene. I’m standing on a huge church front lawn. Behind me, the plain grass has been embellished with decorations — plastic boulders, tree branches and potted plants, vinyl picket fences, bridges over nothing to nowhere — intended to create hiding places for dozens of colorful eggs, filled with candy and prizes. In front of me, a thin yellow rope is all that stands between me and an eager mob of kids from the surrounding neighborhood, barely containing themselves from rushing in to get their fill of yummy sweets and cheap trinkets. I’m constantly reminding them to stay behind the rope while I give them instructions. Then, the time comes to begin the egg hunt. I take the rope in hand and begin counting down. Before I can even get to 1, the tide of children rushes towards me! I drop the rope and take off running, my only means to avoid getting trampled. And there they are, the joy and excitement written on their faces, turning over every fake rock, looking under every fake bridge, all in an effort to find what has been fake hidden. What do I mean “fake hidden”? Well, if you’ve ever hidden eggs for an event like this, you know that the point is not to show off how clever of an egg-hider you can be. In fact, you could even say that you want people to think you’re very bad at your job. 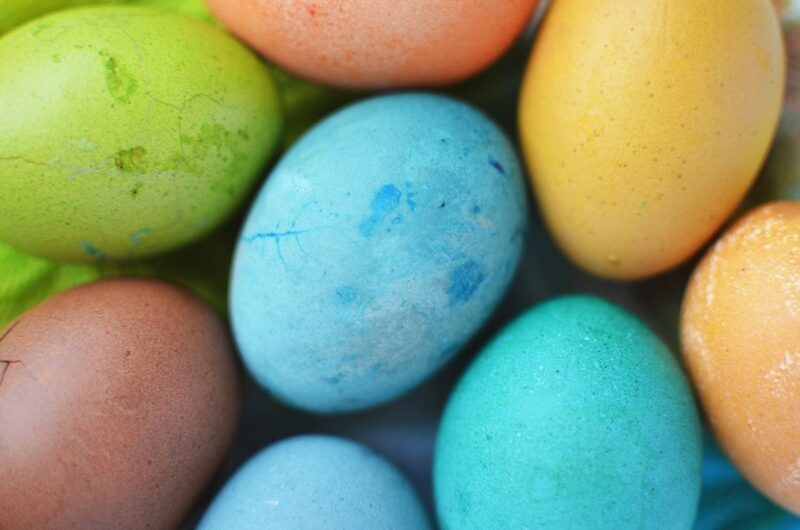 Because the point is actually not to hide eggs; the point is for the kids to experience the thrill of finding what has been concealed, truly calling it their own, and consuming the sugary treats that are inside. As Easter draws nearer, you may be preparing to create a similar scene for children of your own. Or you may be reminiscing about an experience like this from your childhood. In light of this longstanding tradition, I would encourage you to take some time in the weeks leading up to Easter to go on your own egg hunt of sorts. This is part of a larger chunk of the letter in which Paul contrasts the ways of the world with the ways of God, specifically in the area of wisdom. Simply put, what the world considers wise often runs contrary to the deeper, truer wisdom of God. Likewise, the wisdom of God will often appear incredibly foolish to the world. Nowhere is this contrast more visible than at the cross. At the cross, Jesus Christ, God in human form, the King above all kings, allowed himself to be beaten, tortured, nailed to a cross, and killed, all so that we could be saved — we who, by the way, were still sinners, even enemies of God (Rom. 5). This act defies all earthly wisdom, surrendering your own glory and status and even your own life, all for the benefit of someone who is against you. According to Paul, a worldly person cannot accept such things, going so far as to say “they are folly to him.” But, by the grace of God, we can understand. How? Is it because we’re all deep intellectuals that can outthink all the brightest minds in the world? Maybe you are, but I know I’m not. If you are a Christian, you have access to this Spirit. Paul even goes so far as to say that “we have the mind of Christ”! God gently guides us into deeper understanding than we could have achieved on our own, something that does not ultimately come from our own mind, but from His. So why does it rarely feel this way? How often do we try to “wage war the way the world does”? How much do we rely on our intellect, strive to make everyone happy, only to become frustrated when our plans don’t pan out the way we expected? How often do we face our worldly problems with worldly wisdom, when all the while, we have the mind of Christ? Obviously, we must will ourselves to go beyond worldly wisdom. This requires digging beneath the surface. Seeking this knowledge for ourselves. Finding what has been hidden. I once heard a preacher describe this search in terms surprisingly similar to an Easter egg hunt. He compared it to playing hide-and-seek with his children. Much like the eggs in my earlier example, he made what would commonly be considered a poor effort to hide himself. He’d crouch behind an end table and lamp that was far too thin to conceal him. He’d lay under the couch and leave an entire leg sticking out. He would do this on purpose, because his goal was not to hide — his goal was to be found. The same is true of God. We all have access to this deep truth, and we don’t all need a doctorate in theology to get it — we just have to look. Paul makes this point in 1 Corinthians 2:1-2, saying, “I … did not come proclaiming to you the testimony of God with lofty speech or wisdom. For I decided to know nothing among you except Jesus Christ and him crucified.” In other words, Paul didn’t try to talk over their heads, because his goal was not to demonstrate his own intellect, or to reserve the truth of his message for those who were smart enough to follow his reasoning. His goal was to point the Corinthians away from himself and toward Christ, trusting the Holy Spirit to show them the truth of his words. He sought to open their eyes to the Creator of the heavens and earth, the Word made flesh, hiding in plain sight. So how do we look for him? Our search begins in the Secret Place. God wants us to look for Him in prayer. Or have we forgotten the words of Jesus? The problem is that we treat our search less like an Easter egg hunt, or a game of hide-and-seek, and more like a game of Marco Polo. We fumble around without really looking, because we don’t expect to see. We mostly try to go it alone, calling out to God every now and then, looking for a brief, immediate response. And as soon as we hear His voice, it’s right back to our own human striving, trying to move ourselves closer to Him, all the while still blind. We’ve been playing the game all wrong! We need to keep our eyes open! Now, before this metaphor gets stretched too far, don’t go thinking that we’re always going to have immediate and easy answers to every problem. This is putting the cart before the horse. The primary goal is to find Him. We’re not always going to know the answer to every question. Access to the mind of Christ means that we will be given the proper perspective. When we can see our lives and our situations from the perspective of the One who holds everything together, maybe we won’t worry so much. Maybe we will find things to be thankful for in the midst of our most terrifying trials. Maybe we’ll find peace that surpasses all understanding. Another weakness of these metaphors, whether egg hunt, hide-and-seek, or Marco Polo, is that there are specific winners and a finite number of rewards. I find the Easter egg on my own, it doesn’t belong to anyone else, and, let’s be honest, I’m probably not going to share it unless Mom makes me! By contrast, our pursuit of deep spiritual truth is enhanced when we include others, and everyone benefits. Jumping back again to 1 Corinthians 2, it is worth noting that the chapter is between two others that strongly encourage unity in the Church, and discourage divisions. You’ve probably heard these verses before. It’s the part where he talks about how the Corinthians went around saying “I follow Apollos,” or “I follow Paul.” How they divided up into different competing factions, stirring up strife and jealousy. Sound familiar? Just open up your Facebook feed. Well, no, actually, don’t. The point is, these are very human problems, and Paul says so himself in 3:5. And what is the antidote to this human “wisdom”? The “folly” of Christ’s sacrificial love! Whatever you find yourself doing in the days and weeks leading up to Easter, whatever earthly problems come your way, please remember that there are heavenly solutions to them. Remember that we have the mind of Christ. Don’t be content with what’s sitting on the surface. Go deep. Search for your Easter eggs. Ask, and it will be given to you. Seek, and you will find it. Knock, and it will be opened to you. Chances are, you’ll find it hiding in plain sight.